Sorry to interrupt the dramatic tension as Chapter Four comes close to ending, and as someone *new* walks onto the scene but isn't totally SEEN yet, but this is important! 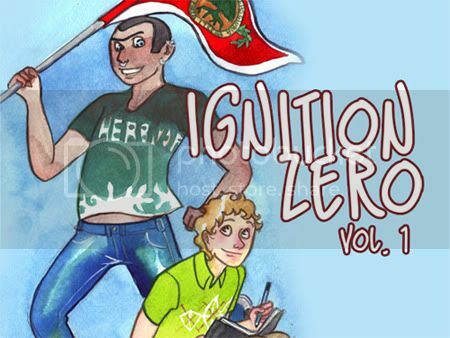 I'm currently raising funds via Kickstarter to print the first volume of Ignition Zero! If you aren't familiar with Kickstarter, it's a thing where you make donations and get cool rewards for doing so; if the project meets its funding goal, the project owner gets the money to make all the rewards & do the project! If not...no one gets anything and all the money returns to your pockets. Click the image above to watch my video and read about the project so you know exactly what I'm up to (and to see me talk to you :P). In the last two days I've gotten SO MANY donations, but I still need more! PLUS, EVEN BETTER, if the project funding goes OVER the $600, there will be even more exciting things happening! If it happens, I will let you know what those are ;D ~ it may or may not involve printed minicomics or 3x a week updates. Even $1 helps, and $5 gets you a physical art print! $20 gets you the book and a print, with (US) shipping included! Plus more! Click and see all the details! EDIT AGAIN: Read about our first stretch goal here! Remember that minicomic about Neve I promised you? If we reach $750, I'll not only up the production values, but print it as well! Support is the name of the game people! Only YOU, that's right YOU, can make this happen. As for the page itself, YOU GOTTA SEE IT. IT'S COMIN! Arrgh! Not the dramatic tension!! All is lost!